On January 15, 1956, Tatsuo Shimabuku founded Isshinryu Karate. 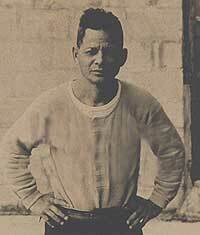 Shortly after that time, Tatsuo Shimabuku began teaching his karate to the U.S. Marines stationed on Okinawa. While the income he received from the Marine Corps was a financial windfall to him, his efforts caused the Isshinryu system to be spread across the United States and the world in the 50's and 60's. This was one of the pioneering efforts spreading karate to a larger world. Tatsuo Shimabuku began his own studies in Okinawa about 1916 at the age of eight, and they continued with such noted Okinawan instructors as Chotoku Kyan (one of the major instructors of Shorin-ryu), Chojun Miyagi (the founder of Goju Ryu karate), Chokoi Motobu (another major Okinawan instructor in the Shorin tradition) and Taira Shinken (a major instructor of kobudo - Okinawan Weapons). The Isshinryu system, as created by Tatsuo Shimabuku , drew on all of these sources. Unfortunately the story of the experiences Shimabuku Sensei gained with his instructors has not been saved. 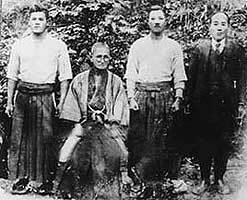 As I've pursued a long-term interest in all of Okinawan Karate, my review of historical information about these men slowly revealed a view of those earlier years. From this research I've created four studies on Tatsuo Shimabuku's instructors. I believe this creates a fuller history of those instructors and their likely contributions to Shimabuku. This history of several of Okinawa's major instructors in the 1900's also highlights some of the trends, which developed in Okinawa. I believe all contemporary martial artists need to consider the transmission of these arts from those days. Their impact reverberates with us still. For some time as I read much written about Isshinryu and Tatsuo Shimabuku, I haven't felt we've been looking at the entire man. Instead it seems as if Shimabuku Tatsuo sprang forth and gave us Isshinryu. His instructors are mentioned but I don't feel we've looked closely enough at the impact of the environment which fostered the founder of Isshinryu. Let me draw an analogy. Each martial artist does represent himself, his capabilities, the work he's done, and his own intentions. At the same time you can view the group of students of an instructor and find a commonalty, too. Many times I've seen an instructor at a tournament who has a distinctive style to his technique, and later through the day, see his students perform and immediately identify their instructor from the commonalty they share. Every instructor is and always has been a product of his own instructor(s), his contemporaries and his environment. Recently I've been trying to understand the environment surrounding Tatsuo Shimabuku. I believe the most important place to start is his relationship with Chotoku Kyan. It was with Kyan that Tatsuo Shimabuku spent the most time. A great deal of the Kata of Isshinryu originated with his training with Kyan, and in the late 1940's to early 1950's, he called his system Chan Migwha Te - using the nickname that had been given to Kyan Sensei. As a starting point I refer to John Sells text "Unante - - The Secrets of Karate." On page 184, we begin to get a vision of the background of Kyan. "One old karateka who can be credited with preserving some of the kata of Tomari was Chotoku Kyan. This student of so many great masters disseminated in his time the tomari-chonto, wansu and several versions of the tomari passai. Kyan introduced ananku kata into Okinawan Karate. He also taught seisan, gojushiho and seisan as learned from Matsumura, as well as Yara's kusanku kata. Of course each form has Kyan's own innovative stamp. This brings to light the fact that most of the old masters taught kata differently at different times in their lives. They also sometimes taught dissimilar versions to different students. Because of this factor we now have a plethora of variations of all the above kata. While this "kata customization" is often associated with Kyan, the same could be said of Matsumura himself and certainly too, of Kyan's contemporary, Funakoshi." Remember what a small place Okinawa was. Without doubt Kyan's students saw their instructor's forms were differing from others who had trained under Kyan's instructors. So issues about Tatsuo Shimabuku changing the nature of his kata and technique at different times was most likely the a continuation of Karate training as he and the others in Okinawa experienced with Kyan. Of course this was noted in Okinawa. The great karate master and founder of goju ryu karate, Chojun Miyagi(McCarthy "Ancient Okinawan Martial Arts-2," page 67 on The 1936 Meeting of the Okinawan Karate Masters), is quoted as saying, "Shorin-ryu's fundamental training [kihon] and open-handed techniques [kaishu] are not taught in any clearly defined way. However the Shorei-ryu's kaishu and kihon are taught according to a clearly established method. My teacher taught us according to the Shorei-ryu method." While I can interpret his words as a commentary on the Shorin teaching methods, it's also interesting to see 'sniping' from 1936 too. We have no lock on the flame wars today! I find it interesting that this was the template against which Tatuso Shimabuku was taught. Whether those changes occurred while he was training with Kyan Sensei, or he whether he observed them as he saw others on occasion who trained with Kyan Sensei, the fact of the existence of change could not have been ignored. Just the other day I was reviewing tapes from a number of Kyan derivative forms. Whether Bunei Okuhira, or Zempo Shimabukuro (son of Shimabuku Zenryo) or Shoshin Nagamine, there is a great deal of similarity between them as well as many differences. Bunei Okuhira and Shoshin Nagamine were direct students of Kyan, as was Tatsuo Shimabuku Sensei. Zenryo Shimabuku was also a direct student of Kyan. I note the more advanced their forms (such as Chinto, Kusanku and Gojushiho), the greater the similarity to my eye. This is something I've noticed between various Isshinryu groups, on occasion. The differences between Seisan and Seiuchin kata are greater than the differences between Chinto and Kusanku. I've always thought this was because the instructor spends more time teaching the beginning forms and less time on the advanced forms. If changes creep in, it would be logical to assume they would occur on those taught most frequently. This is not a scientific move by move comparison, but an impression/opinion observation to my eye. Consider how much of this became the Isshinryu curriculum, directly or indirectly. Wanshu (Wansu), Kusanku, Chinto and Niafanchi from Isshinryu most likely originated here. I would note Wanshu (Wansu) is the most heavily modified of the Kyan forms with knee strikes, side kicks and front kicks not found in the other kata. It is reported at one time Shimabuku Sensei taught Passai amd Ueishi (Gojushiho), and portions of those forms are included in his SunNuSu kata. The kata ananku isn't included in the Isshinryu curriculum, but as I teach one version of same (Ezio Shimabuku's ). I suspect it was because most of the techniques in the form are found in the other Isshinryu forms. Another aspect to consider is the development by Kyan of the vertical punch. Nagamine's book 'Tales of Okinawa's Great Masters by Shoshin Nagamine,' on page 89 has a nice section on the life of Kyan. "Because of his tiny size, Sensei spent considerable time and effort developing his jodan-tsuki (rising punch). 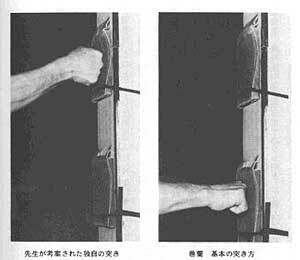 Never having altered this technique, Kyan's jodan-tsuki represented his own interpretation of using the strike in a practical way for a person of his size. It can be said that his unique jodan-tsuki exists in no other ryuha and must therefore illustrate his own understanding of karate-do." Accompanying photographs show a traditional turning punch striking a makiwara and a vertical punch striking a makiwara. The latter was described as "Kyan's original punch." I would believe it likely Tatsuo Shimabuku may have used his instructor's teachings as the source of his choice of the vertical fist. At least 7 of them became instructors in their own right and developed their own systems. While Chotoku Kyan taught his art, he apparently did not try to establish a single system. That seems right to me, as I'm unaware of any real effort to do this in those earlier days. I believe this is an important aspect affecting the development of all Okinawan karate. And while there is a great deal of similarity between these instructors' forms and techniques, there are also a great many differences at the micro level, if not the macro level. If I recall correctly Patrick McCarthy has written on the fact that the concept of organization was imported to Okinawa by the Japanese. Without doubt, their penchant for organization created the first large international karate organizations. Thus the teaching template Shimabuku Sensei observed most likely was that of instructing your students so that they would go out on their own. There does not seem to be a regulating mechanism to pass along changes or control the 'correct form' of the system. Does not the same situation seem to reside in the changing system of Shimabuku Sensei? I believe reflection on these aspects of the karate of Kyan shows they may well have influenced the decisions to the developing art of Isshinryu of Tatsuo Shimabuku. There are many parallels between Kyan's choices to those made by Shimabuku Sensei.